covered parking 20 parking spaces available at 300m. The Hotel Des Bains is a 3-star seafront hotel that has its own private beach, bar terrace overlooking the street of the evening promenade, garden with playground area, sun terrace with sea view, WI-FI in the hotel and on the beach, 2 large parking lots. Small and medium-sized pets are allowed. 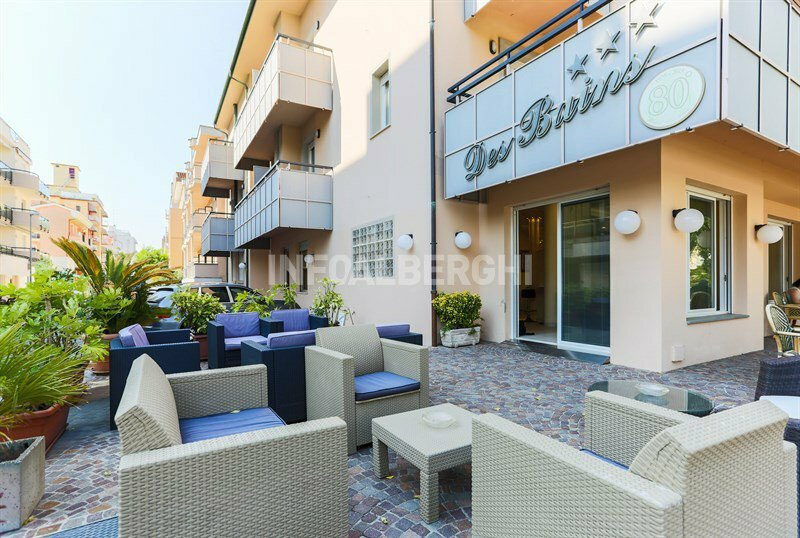 It is located in Via Carducci, a few meters from the beach which can be reached in a minute on foot. From the hotel, with a short walk you can reach both the Cattolica aquarium and the pedestrian area and the city center. The rooms are all equipped with a balcony, soundproof windows, independent air conditioning, satellite TV and digital terrestrial, direct telephone, safety deposit boxes, WI-FI connection, mini-bar (on request), private bathroom with shower and hairdryer. FAMILIES : available family and connecting rooms that can accommodate up to 6 people. Garden with playground area, terrace bar on the promenade, rooftop sun terrace, sunbeds, beach umbrella and showers, free bicycles, lobby with satellite TV, HI-FI, reading room, newspapers, card room and games room, beach towel, lift, laundry service. Equipped for cyclists. PARKING : uncovered, in a 45-seater hotel, or 20 at 300 meters. 2-seater garage. WI-FI : connection throughout the entire hotel and on the beach. AGREEMENTS : private beach, agreement with the beach, Aquarium of Cattolica, bicycle and motorcycle shop. SERVICES FOR DISABLED PEOPLE : entrance with inclined ramp, standard lift, room with wheelchair space, accessible shower, shower chair. BREAKFAST : buffet with cakes, ring-shaped cake and homemade pies, biscuits, croissants, yogurt, jams, cereals, meats, cheeses, eggs and more. LUNCH AND DINNER : 3 menus to choose from meat, fish and cold dishes, buffet with fresh vegetables, steamed vegetables, fruit baskets and desserts. VARIATIONS : the menu offers vegetarian and vegan dishes. In the hotel : indoor and outdoor playground area, children's pool, strollers, access ramp for strollers, bicycles with seat, pediatrician and baby sitter on request. In the room : cot, bed rails, toilet bowl reducers, bath tubs. At meals : baby menu, baby food, high chairs at the table, bottle warmer, afternoon snack on request. On the beach : baby / mini / junior club at the affiliated bathing establishments, playground area, changing table, entertainment. Hotel guests have access to the private Les Bains 89 beach, equipped with sunbeds, deckchairs, beach umbrella, bathrooms and showers with hot and cold water. The establishment also offers a children's area with a changing table, a playground area with a ping-pong table, table football and other games, a bookshop, boat trips, a bar, pedal boat rentals with slides and flies. 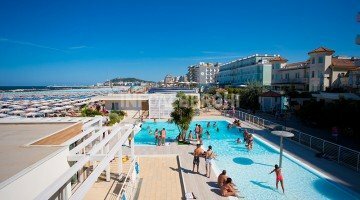 Moreover the Hotel Des Bains has an agreement with the beach 90/93 Malù where there is a large pool of 130 square meters. The prices of the price list are per person per day for a min. of 3 nights. Possibility also of only overnight or overnight stay and breakfast. Do not hesitate to contact us, we will prepare packages according to your needs. You can stay alone in a double room without paying any extra charge! Book now your holiday for summer 2017. Comfortable rooms up to 5 beds and communicating rooms equipped with all comforts. and find out what dates your children can stay for free! The Cattolica Aquarium is on the same avenue as the Hotel Des Bains. Within walking distance it is about 300 meters from the hotel. - beach umbrella and sun bed. free parasol and sunbeds at the private beach "Les Bains 89"